Seattle Seahawks quarterback Russell Wilson’s autographed football is being auctioned off by the American Physical Therapy Association for the Bob Doctor Golf Tournament July 26 at the Colorado National Golf Club. The football is valued at $425 with a $200 minimum bid. Here’s the link to bid: https://www.blacktie-colorado.com/auctions/index.cfm?fuseaction=Auctions.Item&aid=627&iid=597221. 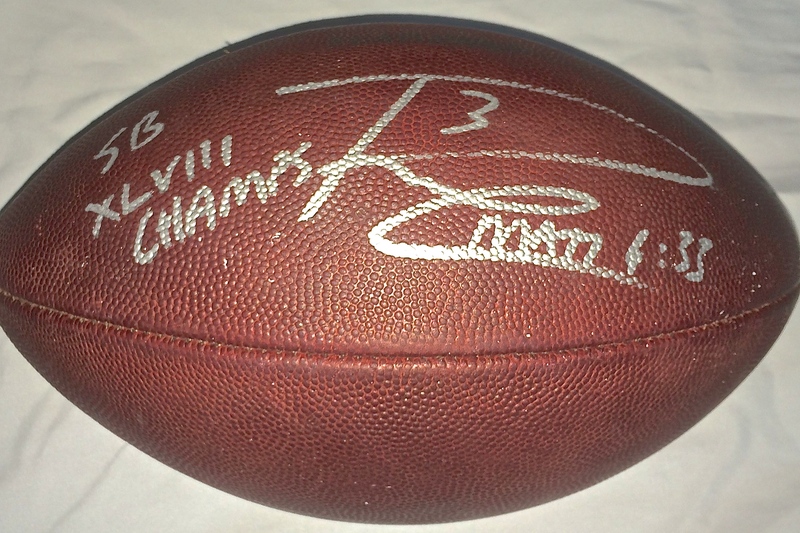 The ball not only bears Wilson’s signature, but “XLVIII Champs is noted as well.” For those still smarting from the Seahawks’ drubbing of our beloved Broncos (43-8), you might want this souvenir to kick around. Here is link to golf tournament info: http://coloradophysicaltherapists.org/apta-events/bob-doctor-golf-tournament/. The football autographed by Seahawks quarterback Russell Wilson for the American Physical Therapy Association for the Bob Doctor Golf Tournament.